Finding yoga really forced me to take a long, hard look at my relationship with food and how it fueled me. I was practicing Ashtanga yoga at the time and my body craved nourishment after my long, powerful, sweaty practices. So, I quickly learned how to adapt and feed my body what it needed so I can bring my best self to the mat every day. And as a bonus, I had more energy than I ever could have even imagined. 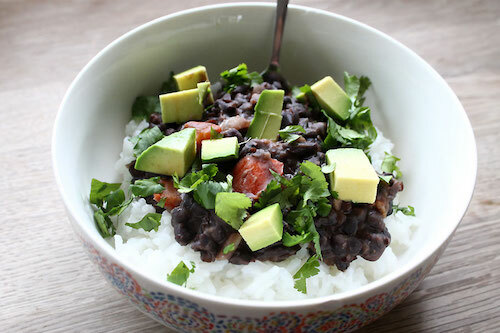 So to help my fellow vegetarian yogis, I'm sharing some of my favorite recipes as part of this 3-day vegetarian meal plan. Note: Feel free to substitute or skip any ingredients that don’t mesh with you or your body. To start, chop up the garlic and onion (as much as you like) and lightly oil a frying pan. Simmer the garlic and onion on low heat until you can smell their aromas and then add the sweet potato sliced into small, bite-sized chunks. Raise the heat slightly and cook until crispy and browned. While it’s cooking, mix together the eggs, milk, chopped asparagus and crumbled feta into a bowl and whisk. Lightly oil a separate pan and pour the contents of the bowl into it on a low heat. Constantly scrape the pan to evenly cook the eggs. When everything is cooked, mix in the sweet potato and warm a tortilla in a lightly oiled pan on low heat. Fill the contents into the tortilla, wrap to form a burrito and enjoy! In a big bowl, mash up the chickpeas as much as possible and mix in all the other ingredients (except, of course, your bread and sandwich fillings). 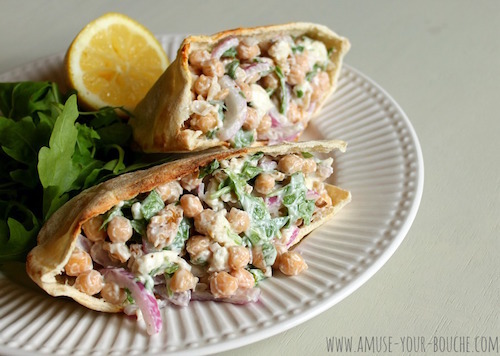 Salt and pepper to taste and then stuff inside a pita or your bread of choice, adding whichever fillings you’d like to complement the chickpea salad. Chop the veggies and place them onto a large tray to roast in the oven at about 350 degrees F. Drizzle with olive oil, salt and pepper to taste and maybe add whole cloves of garlic to roast beside the veggies. Then chop more garlic and the onion and lightly sear in a pan drizzled with olive oil. Stir in your washed spinach and pan-sear for about a minute or two. Mix the spinach with your quinoa and add as much ricotta cheese as you would like. Drizzle the whole mixture with olive oil and salt and pepper to taste and mix together. Stuff the quinoa mix into the gutted tomatoes and top with as much shredded mozzarella as you would like. 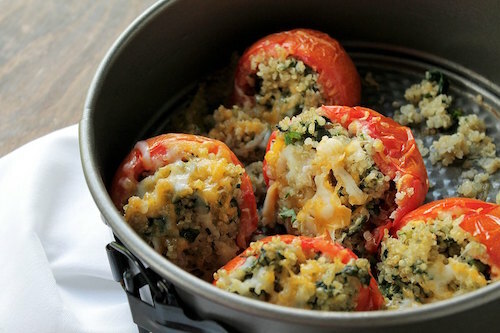 Place the stuffed tomatoes into the oven for about two minutes (just enough so the cheese on top melts) and then remove the tomatoes and the roasted veggies and serve hot. Mix everything together in a bowl and enjoy! 1 can of beans of choice (black, pinto, etc. ), rinsed and drained – but keep the liquids from the can! Start by cooking the garlic, onion and pepper in a lightly oiled frying pan and then add in the beans, tomato paste, and the liquid from the beans. You can either mix the rice straight into the whole mixture or keep it separate. For your salad, mix together the kale, avocado, strawberries and walnuts. Salt and pepper as desired and drizzle with olive oil and balsamic vinegar. 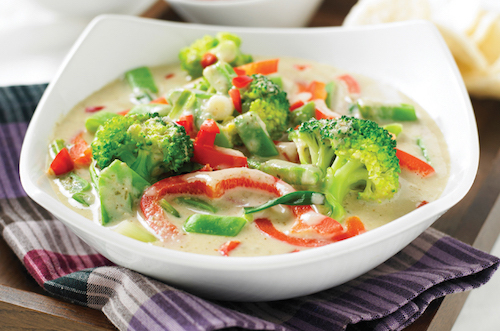 Feel free to add any extra veggies that you’d like. Chop the garlic and onion and simmer with olive oil in a pan on low heat. Add all your favorite vegetables and the pinto beans to the pan. Add in the tomato paste and the vegetable broth. Sear until all the vegetables are cooked and add the spices of your choice to make your favorite seasoning. 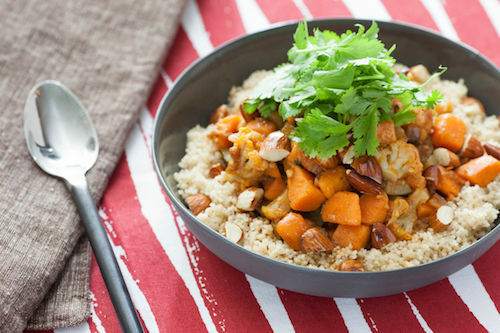 Serve warm over the couscous and enjoy! Cook the quinoa in the milk of your choice and then add your toppings of choice. 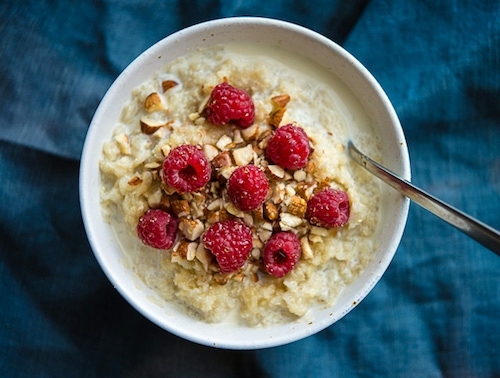 Personally, I love to add raspberries, pecans and pure maple syrup. Start by sautéing the garlic and onion in a bit of coconut oil in a large pot on low heat. Add in the curry paste and the coconut milk to form a sort of stew. Mix in the vegetables and tofu and let them cook in the curry. Serve hot beside a serving of rice. Start by slicing a wide line through the top of the potatoes, oil and salt and pepper them, and then bake for about 40-60 minutes at 350 degrees F, checking constantly. To make the tzatziki: mix the Greek yogurt, dill weed, grated cucumber, garlic, olive oil and lemon juice together. Measure according to your own taste. To make the guacamole: mix the avocado, onion, garlic and diced tomatoes together. Drizzle with lime juice. Measure according to your own taste. Lightly oil the eggplant on a baking sheet and bake at 350 degrees F for about 5-10 minutes or until lightly golden (turning the slices over once at the halfway mark). Remove the potatoes and the eggplant from the oven. 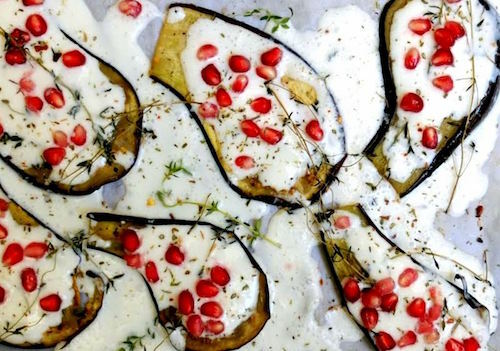 Drizzle tzatziki over the cooked eggplant and garnish with pomegranate seeds. Serve with a baked potato topped with guacamole. Hopefully, these quick meal ideas inspire you to bring variety and love into your kitchen. Allow cooking to become a daily meditative practice of nourishing yourself and allow your food to become your best friend (rather than your enemy). Watch how your practice, your body and your mind transform.